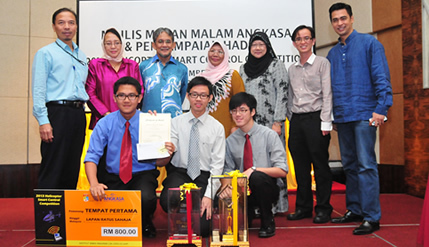 PURTAJAYA, 7 Dec 2013 – A team of four PERMATApintar students of The National University of Malaysia (UKM) has emerged winners at a special high-tech 2013 Helicopter Smart Control Competition using computer software specially created by them. The four students; Tan Ze Song, Darwiis Muhammad Bin Mohammed, Joshua Ling Sheng and Barry Bato Layu won RM800 cash when they beat nine other teams from six schools which participated in the first such tournament. SMK Dato ‘Abu Bakar Baginda, Bandar Baru Bangi emerged as the first runner-up receiving RM600 with Polytechnic Banting, Selangor as the second runner-up getting a cash prize of RM400. Deputy Vice-Chancellor (Research and Innovation) Prof Dato’ Dr Rahmah Mohamed presented the prizes in the form of trophies, certificates and the cash in a special ceremony here today. The competition organised by the Institute of Space Sciences (ANGKASA) of The National University of Malaysia (UKM) was held on Dec 4 at the university. ANGKASA Director Prof Mohd Alauddin Mohd Ali and Malaysian astronaut and ANGKASA principal research fellow Datuk Dr Sheikh Muszaphar Shukor Al-Masrie attended the ceremony. Prof Rahmah said the success of the students aged at about 15 showed that local youths can compete in the field of information technology to the extent of creating special software for mechanical devices. She expressed confidence that learning science, technology and mathematics (STAM) will provide a suitable route for their aspirations to become innovative scientists and researchers. Chairman of the competition and fellow researcher at ANGKASA, Dr Gan Kok Beng explaining the background to the competition to UKM News Portal said the Global Science and Innovation Advisory Council (GSIAC) of the United States in collaboration with the Malaysian Industry-Government Group for High Technology (MIGHT) invited Dr Daniel T Barry, an American astronaut to hold public lectures, helicopter programmes and lego workshops at several universities including UKM on October 30, 2012 . As a follow-up to the success of the 2012 Helicopters workshop, ANGKASA organised the event as the Smart Control Helicopter Competition 2013 in UKM . The competition is aimed at attracting teams from secondary schools, polytechnics, PermataPintar and first year students of the Faculty of Engineering and Built Environment. It is aimed at developing teamwork skills to build hardwares and softwares in groups. It is also aimed at promoting problem-solving skills related to mathematics, science and engineering. At the same time students are able to understand the process of building and programming microelectronic systems, Dr Gan said.